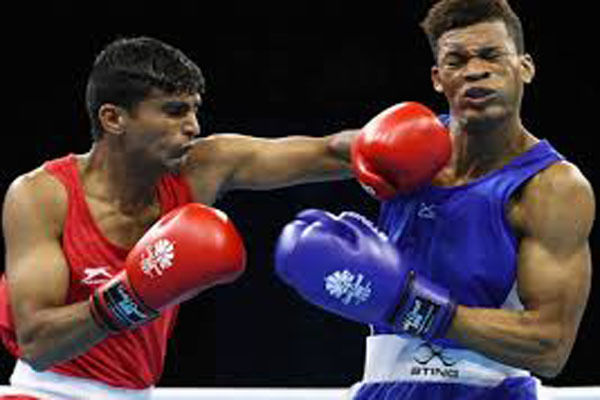 Gold Coast(PTI): The debutant duo of Gaurav Solanki (52kg) and Manish Kaushik (60kg) advanced to the quarterfinals, continuing Indian boxers’ fine preliminary run at the Commonwealth Games here today. While Solanki eased past Ghana’s Akimos Annang Ampiah 5-0, Kaushik staved off some early resistance from Trinidad and Tobago’s Michael Alexander to win 4-0. Solanki was the first to take the ring and was quite a dominant force against a rather timid opponent. However, the Indian was modest in victory and lauded his opponent. He will next face Papua new Guinea’s Charles Keama in the last-eight stage on April 11. “He was a bit of a challenge as he was very fast,” Solanki said after his bout. Also advancing to the quarters was Kaushik, who was a shade rusty to start with but got into his groove quickly enough for a comfortable win in the end. Kaushik has a tough one lined up in the quarterfinals as he will be squaring off against England’s European Championships bronze-medallist Calum French. Indian boxers have so far been assured of one medal courtesy M C Mary Kom. The five-time world champion advanced to the semifinals after winning her preliminary bout yesterday.